As Egypt is poised to implement buffer zone plan expelling Gazans from border, security sources say Hamas behind Friday carnage. Egyptian security sources report that the two deadly attacks last Friday on El-Arish in the Sinai peninsula that killed at least 31 Egyptian soldiers was aided by none other than Hamas. According to the sources quoted by Channel 10, those actually carrying out the suicide bombing at a checkpoint and a shooting in the city were Ansar Bayt al-Maqdis jihadists, members of a group sympathetic to Islamic State (ISIS). 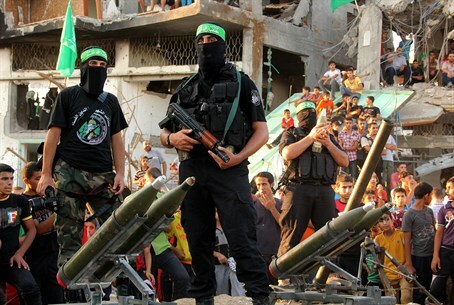 However, the sources added that the weapons used in carrying out the attack were given to the group in Sinai by Hamas terrorists, who transferred the weapons through one of the myriad of tunnels breaching the Sinai border with Gaza. Egypt on Wednesday gave Gazans living on the Sinai border 48 hours to evacuate their homes, but later extended the period when faced with protest. The expulsion is part of a "buffer zone" plan that is to seize and evacuate all homes and farmland up to 500 meters (over 1,640 feet) into Gaza, all along the 13 kilometer (over eight mile) border. Additionally, a channel with a depth and width of 20 meters (over 65 feet) will be dug along the Gaza border. Around 200 families living in the area have already accepted a financial package of compensation to abandon their homes, but 680 more families reportedly are still clinging on in the borderland. Perhaps unsurprisingly, there has been no international condemnation over the Egyptian expulsion of Gaza, which President Abdel Fattah al-Sisi justified by citing the attack, insisting that "Egypt is fighting a war of existence." While Egypt has deployed troops to the Sinai to fight the rampant jihadist terrorism in the region in coordination with Israel, concerns remain that the Egyptian disarmament of the peninsula as part of its peace agreement with Israel may be in danger of collapsing altogether.